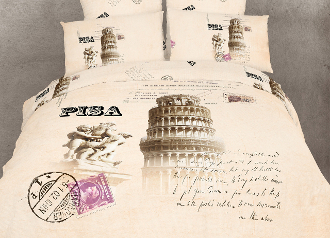 Decorate your bedroom with the souvenir print of Pisa surrounded with memorabilia letters, and printed dazzlingly on our soft combed cotton fabric, to create a sophisticated retro bedroom effect. 4/6 Pieces Luxury Duvet Cover Set, Bed in a Bag with Reversible Design. Fits standard Twin,Extra Long Twin,Full/Queen and King size mattress up to 16 inches tall.